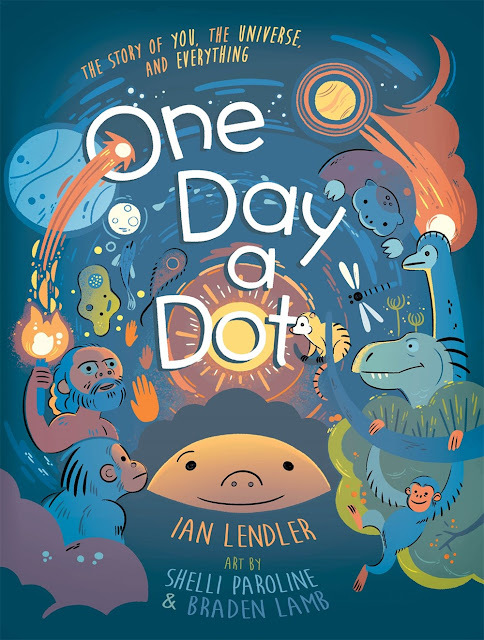 One Day a Dot: The Story of You, The Universe, and Everything by Ian Lendler, Shelli Paroline, and Braden Lamb is the epitome of a picture book/early reader comic hybrid. 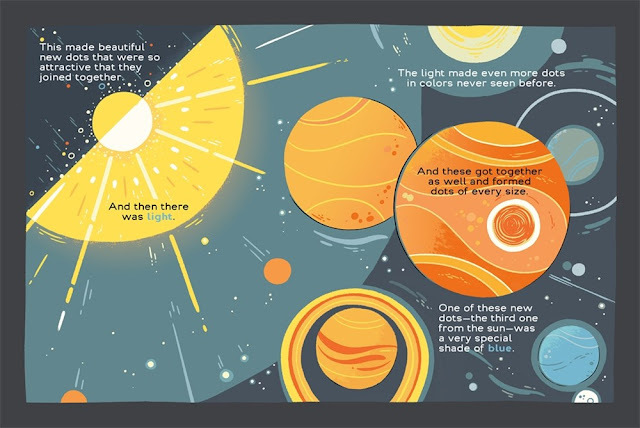 It has bright graphics and paneled illustrations reminiscent of early reader comics but with the length of a picture book, making it the perfect book for starting small conversations about a very rather large topic. 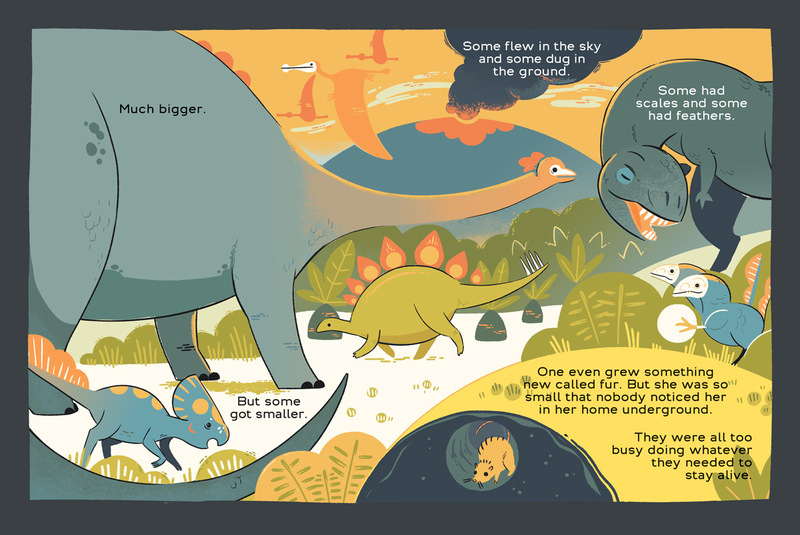 I got a chance to interview Shelli and Braden about how they meshed these two illustration styles––not to mention their own illustration styles––to create the book. Enjoy! Let's talk Shelli Paroline and Braden Lamb! 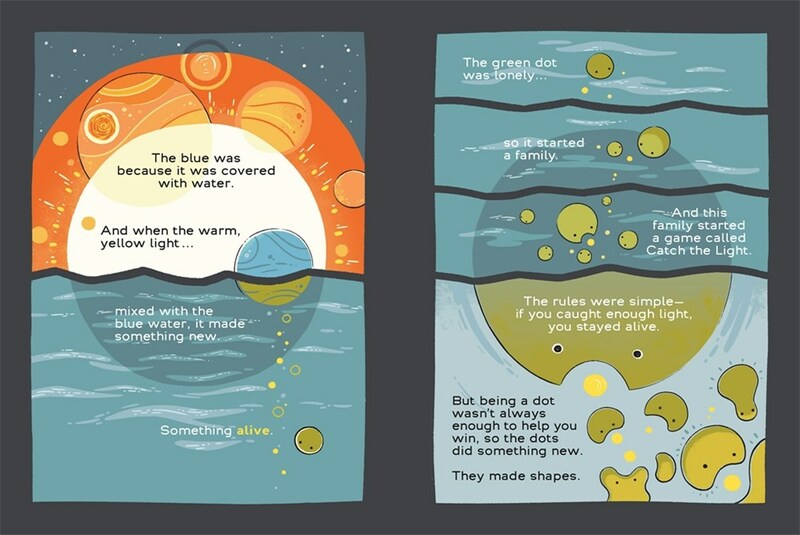 LTPB: One Day a Dot walks that fine line between picture book and early reader comic, but did you always plan it that way? SP: We knew we’d have to cover a lot of ground at certain points in the book, so we decided early on to use our strengths in comic storytelling to help out. The story is all about progress and changes, and we wanted to see some of that happen on the page, rather than just big leaps between pages. LTPB: Many illustrators don’t meet their fellow collaborators, let alone live with them! Since you two are married and live in the same house, what was it like working on this project together? How do you two work together/divide up work? BL: It’s part collaboration, part assembly line. Some steps we like to be in the same room bouncing ideas back and forth, and for other steps we take the files to our own stations to focus. SP: We approached the look of this project like an animation studio. Because we each have individual styles, we worked on concept art for a while because it wasn’t obvious whose style we might tap into. We eventually hit on using circles to visually tie everything to the dot that’s the focus of this narrative. LTPB: What kind of research did you do (factually and visually) to get the images right? How did you mix in the realities of your research with your own unique art styles? BL: We didn’t know it, but I’ve been researching for this book for most of my life, because I love natural history! You’ll see a few of my favorites in there, like Brachiosaurus and Tiktaalik - one of the first land-walking vertebrates. SP: Right before we heard about the project we went to the Harvard Natural History Museum for general inspiration and we fell in love with the skeleton of an early mammal called Glyptodon. It was basically a bear-sized armadillo, and its skull had long, hanging jowl bones that made it look like it would talk like Droopy Dog. We put him in the book every chance we got. BL: We did quite a bit of visual research on each period that was covered in the story, but it couldn’t all be totally accurate, because everything had to feel like it belonged in the same picture book. 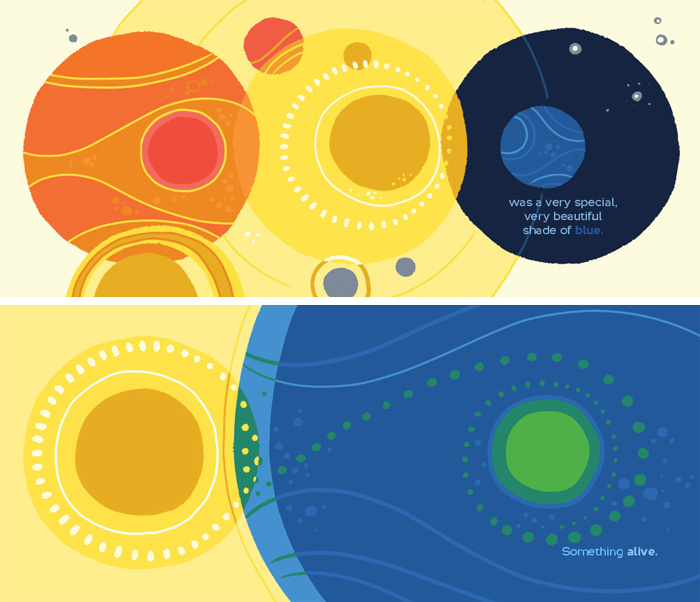 We were going to be drawing everything from the solar system, to microbes, to dinosaurs, to cities, so going with a flat, round style gave it all a unified theme. LTPB: What did you use to create the illustrations in this book? Is this your preferred medium? How do your processes change from book to book? 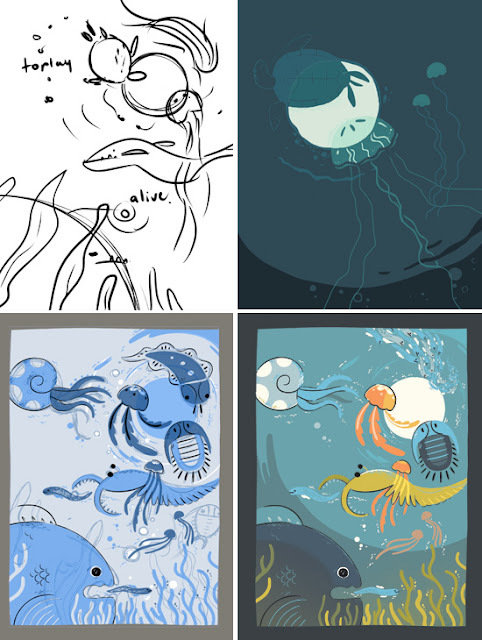 SP: Apart from a few creatures we sketched on paper, basically all of this book was done digitally. Most of it is done in Clip Studio, but we developed the final colors in Photoshop. BL: As we usually do, we started by sitting down at one computer with two screens and two digital drawing tools to do rough sketches of what each page might look like. After that we divide and conquer based on our schedules and our strengths. 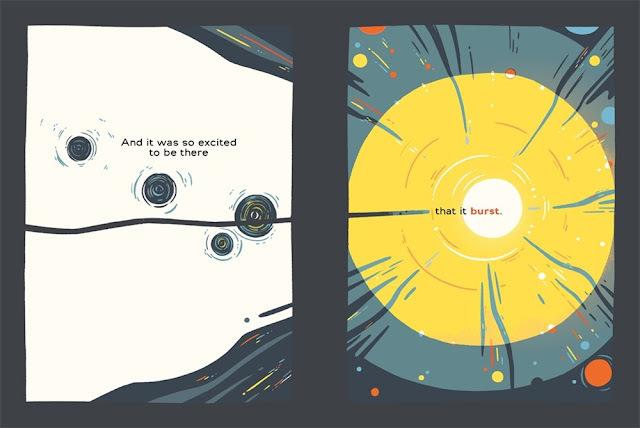 SP: Our experience making this picture book was different because it was so much more like graphic design than sequential storytelling. Each image was so important and had to communicate more information and feeling that we ended up going back to tweak the individual compositions way more than we usually do when making comics. LTPB: What are you each working on now?Anything you can tell us? SP: We can’t quite announce what we’re working on next, but it’s going to be a fantasy adventure comic. We’ll get to explore more of our love of nature with an invented world where plants grow fast and aggressively, and an early human civilization struggles to flourish. 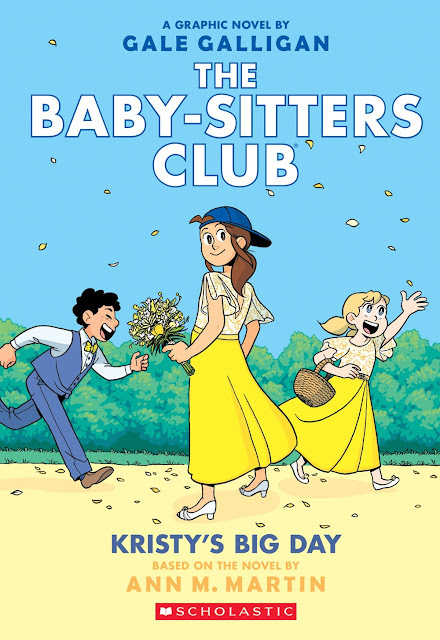 BL: I can tell you that Kristy’s Big Day, the most recent Baby Sitters Club book I colored, will be out on August 28. 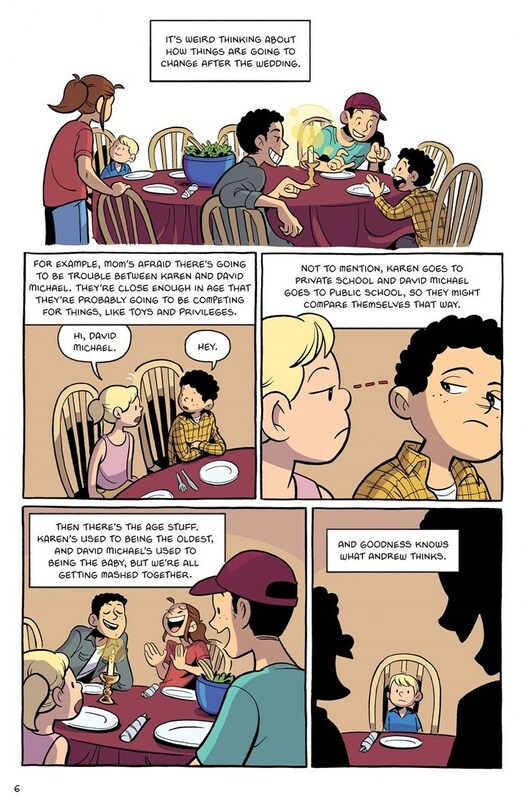 Gale Galligan does an amazing job translating the books to comics with her gorgeous cartooning. I’ll be starting colors on the next one soon! BL: Dead or alive? I choose dead. I’d love a ghost to draw my autobiography! A million thanks to Shelli and Braden for taking time to answers some questions! 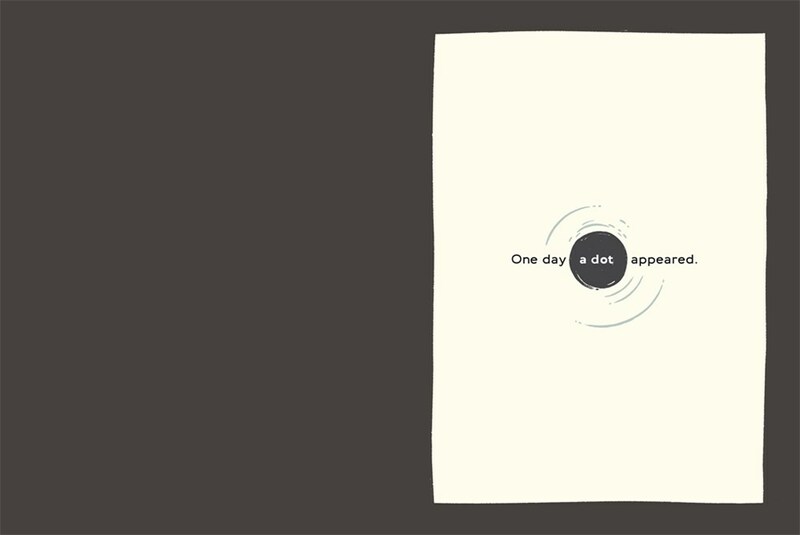 One Day a Dot: The Story of You, The Universe, and Everything published from First Second in April! Special thanks to Shelli, Braden, and First Second for use of these images! I love the illustrations and what a cool idea!